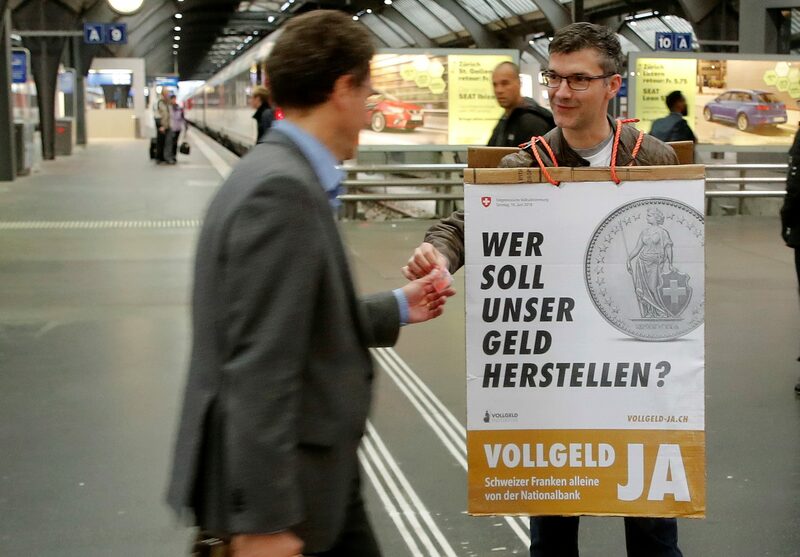 A member of the sovereign money initiative, a referendum campaign that would abolish traditional bank lending and allow only money created by the Swiss National Bank (SNB), offers flyers to travellers at the central railway station in Zurich, Switzerland May 3, 2018. Swiss voters go to the polls on June 10 for a referendum on whether the country should switch to a “sovereign money” system. If approved, the constitutional amendment would turn the Swiss National Bank into the only source of new money, effectively banning commercial banks from creating cash-like deposits. The SNB opposes the plan, which Governor Thomas Jordan has described as a “dangerous cocktail”. A survey by the gfs.bern polling outfit on May 30 found that 54 percent of voters opposed the plan, while 34 percent were in favour and 12 percent were undecided or had no opinion.